A lot has been changed and updated since I first built my AER/TOGA model’s SU-100 and wrote my review for On The Way back in the year 2000. 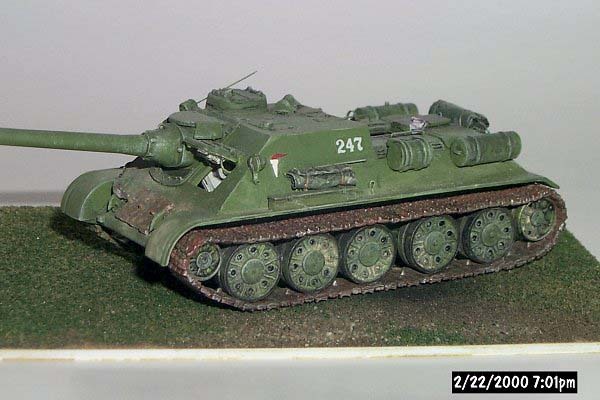 While these models were the best, actually the only, 1/72 SU-100 and SU-85 in styrene in 2000, they now have competition. New 1/72-scale models have been released by UM and by Dragon and our standards for accuracy and detail in our models, and standards in our kit reviews, have also become more demanding. Please note tha,t though these kits are -or were - sold under different manufacturer’s names; I will refer mostly to AER Model Studio Company as they were the most commonly found. The box art for TOGA’s SU-100 kit is a touch crude but shows the basic model in the box. 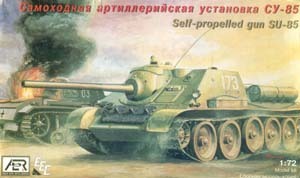 Significant differences are that this art shows the SU-100 with the correct angular fenders and solid dish-style roadwheels; while the TOGA/AER kit actually contains steel-tired roadwheels and the original T-34 curved front fenders which are incorrect for an SU-100. AER’s SU-85 box shows more accurately what is in their kit box then the SU-100 kit. The front curved fenders are correct for an early SU-85 and the roadwheels in the box are the same correct dish-style actually within the kit. Unlike the ESCI T-34 dish roadwheels AER’s does have the bolt detail. Note the subtle differences from the SU-100 in the mantlet and lack of commander’s cupola. The drum shaped fuel tanks seen here were not typically used when in combat. Compared to ESCI, these kits came in the mid-1990s from the relatively new Belorussian and Russian manufacturers to the US and to Western Europe. Besides these two Soviet WW2 assault gun/tank destroyers a T-34/85 tank and a number of ZIS truck variants were also offered under the Coopertiva, Toga, PST and AER company names. Except for box art, instructions and decals, all these kits under the different company names are the same. The SU-85 was developed from the T-34/76 as a turretless, well armored self-propelled 85 mm gun, in order to provide a more effective self-propelled antitank gun and for infantry support like the German Sturmgeschütz and Jagdpanzer IV. As the T-34/76 was up-gunned to the T-34/85, the SU-85 was in turn up-gunned to the SU-100 with a 100 mm gun, in order to deal more effectively with the German Panther and Tiger tanks. Entering service in 1944, it continued on post-war with the Soviet Union and its European allies, in Korea, and in the Middle East. 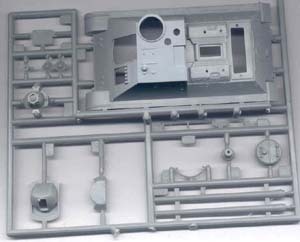 Each kit comes in about 118 injection molded styrene parts of which 52 parts are the hard styrene link & length tracks. I found surface detail to be respectable and the SU-100’s size matches Esci's 1/72 scale T-34 well. [No, I did not measure it out to check exact scale.] Getting the SU-100 first, I anticipated that the SU-85 would be essentially the same kit though with a few new parts, since they were very similar vehicles. In actuality the two model kits are different entirely. While they both have similar construction steps, the same tracks and approximate quality of surface detail, it appears to me that the SU-100 is more 1/72 scale and the SU-85 kit is slightly smaller in some dimensions. 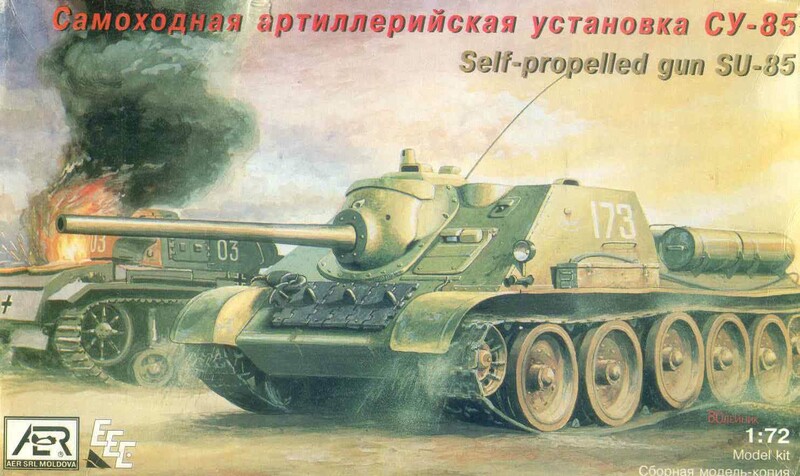 The SU-85 has the dish-style T-34 roadwheels as well. 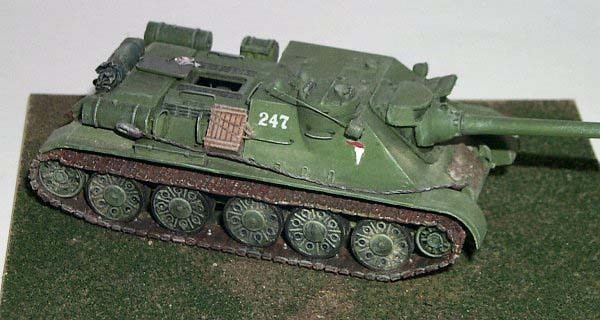 The SU-100 kit has a mediocre rendering of an all-steel roadwheel that was common to the T-34 of 1942 and 1943, not the SU-100 of 1944 and 1945. 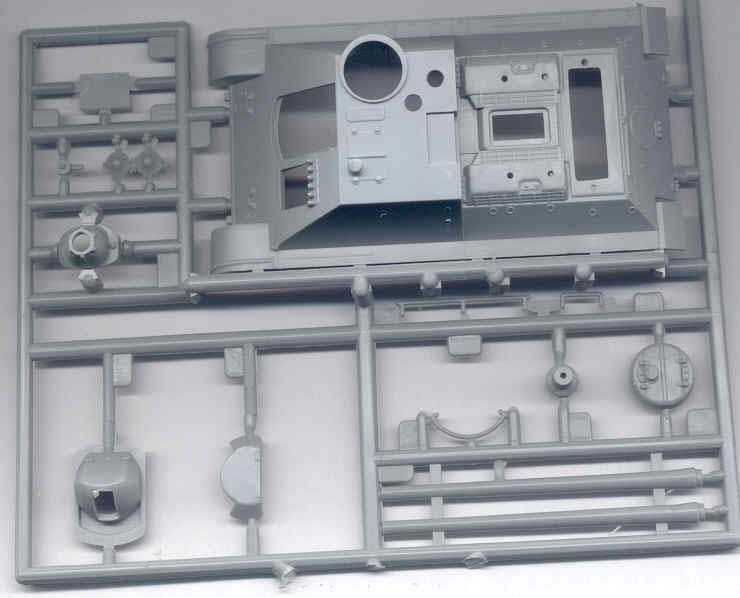 Here is a scan of the SU-100 sprue containing the superstructure, mantlet parts and two 100-mm gun barrels at the lower right. The rear superstructure hatch is separate though it's odd that the location under the hatch location is solid, i.e. blanked off. The hull sides can use some weld seams and the cupola can use vision ports. Overall the hull is still quite respectable in detail and quality but not up to contemporary Revell and DML quality. Comparing this SU-85 scan to the SU-100 kit scan above, we can see that AER’s SU-85 superstructure is different from their SU-100. The engine hatch is now modeled closed but the rear crew compartment hatch is molded the same as on the SU-100. Note that there is no true commander’s cupola on the SU-85 but a raised bulge with periscopes (the later SU-85M based on the SU-100 hull did have the cupola). Fortunately, the SU-85 kit has the correct roadwheel spacing. Another odd error with the SU-100 (and its companion T-34/85 kit) is that AER placed the larger roadwheel gap between the vehicle’s third and fourth roadwheels when this gap actually should be between the second and third roadwheels! I did not catch this until after I built the kit. This error can be fixed during construction by shaving off the third axle from the front, and then repositioning it slightly back. This wheel spacing detail on the SU-85 kit is correct. As this is not a full construction article I refer to the many excellent references on the web and in our bookstores for better clarification. Left side of TOGA-AER’s SU-100. Driver’s hatch is open with a rudimentary interior visible. Wire grab handles were added; otherwise no aftermarket parts were used. The stout fuel tank on the left side I understand to actually be for the smoke generator and should be mounted on the rear plate outside of the exhaust (how much we learn in nine years). Please do not use this old model as a representative of an accurate SU-100. I noted quite a problem with fit with on my SU-100, particularly with the superstructure and lower hull. It required much filling and sanding to close off the gaps. Like other AER kits, the styrene seemed much softer than what I've encountered with Revell and Hasegawa kits. Extra care then must be taken so as not to sand off too much plastic or break parts. 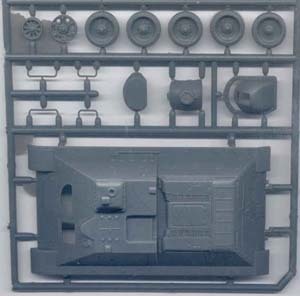 A plus is that the tracks come in molded "link & length" styrene sections like PST and the later Esci kits; except that the Russian kits have well-formed track teeth which are missing from many ESCI styrene tracks. The tracks went together well and were among the best in this scale I've seen at the time I assembled my model about 10 years ago. The engine and driver’s hatches I modeled open and a simple engine, driver’s seat and gun breach built. There is no detail on the inside of the SU-100’s driver’s hatch, though there is detail on the inside of the SU-85’s driver’s hatch. Tow cables were made from twisted copper strands. Etched brass frets for the SU-100 are made by both Eduard (#22 019) and by PART (#P72021). I have not noted any frets made for the SU-85 though many brass parts for the SU-100 would be in common with both AFV’s. 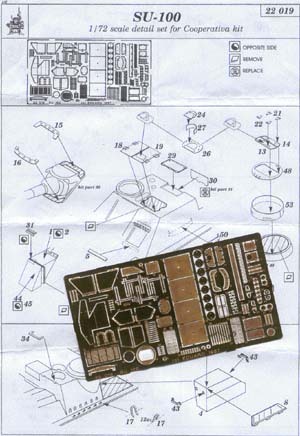 PART also makes 1/72 etched brass T-34 tracks suitable for these kits. This is right side the 1/72 SU-100 with engine compartment open, a scratchbuilt rudimentary engine installed, and with a wrench and rag next to the open engine hatch. Note the incorrect spacing of AER’s second and third roadwheels. The vehicle's tow cable was made with twisted fine copper wire and the kit’s cable ends glued on. The tires on the spider-roadwheels were a bit thick for all-steel wheels, but too narrow for rubber tired wheels. Around the perimeter of the wheels the holes should be drilled out. I believe that the roadwheels are the weakest part of the kit and could use being replaced by aftermarket wheels or wheels from another T-34 based model. Toga's kit instructions are adequate and clear, though not as good as AER's. Painting guides are on the box art and instruction sheet. When assembled back in 2000 I used a medium Humbrol forest green enamel paint, though I usually prefer Poly-Scale acrylics. No decals were offered in my kit, which is odd, since markings and slogans were common on Soviet armor late in the war. I borrowed some decals from AER’s Zis-5 truck kit. Though the kit has some problems (and what kit doesn't ?) an intermediate level builder should be able to build this into a fine looking model. I recommend this kit for a beginner to intermediate builder, especially for a wargamer where historical accuracy is not as critical. 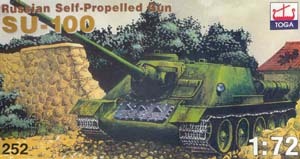 I would refer a display modeler to an UM or Dragon SU-100 or SU-85 models.